The anonymity of virtual currency is one of its major attractions, and with anonymity of currency, rose a demand for anonymity of market place. Deep web, anonymous marketplaces however, are increasingly proving to have limited longevity, as the US government cites them as outlets for the illicit marketing of illegal products and services. 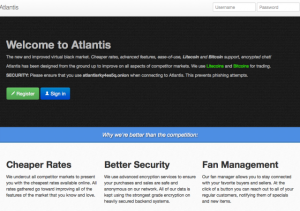 Whilst Silk Road continues to generate $92,000 dollars per month in revenue, one of its alternatives, Atlantis, closed its virtual doors for the last time by issuing a notice on its website yesterday, notifying users of its immediate closure, and intention to cease all business operations within one week, at which time, all crypto-currency which remains in its system will be removed by the site administrators and donated to charity. During the course of this week, Atlantis is allowing all users to withdraw virtual currency before operations are permanently closed, after which all unclaimed coins will be donated either to a drug-related charity, or any other charity of the site administrators’ selection. The closure of Atlantis signals the end of what can only be described as a short existence for the service, which commenced operations on March 14 this year, when it declared itself as a read-across from Silk Road for Litecoin, to make its mark in the crypto-currency world, thus providing a similar service which backed it.